If you are living with the embarrassment and discomfort of missing teeth, you are missing out on the benefits of today’s dental implant technology. At Mesquite Dental Smiles our dentists have advanced certification in dental implants – we can quickly and painlessly help you restore your smile and your self-confidence. When you lose a tooth, the dental problems you may face go well beyond cosmetic concerns. A missing tooth can start a chain reaction that affects your entire mouth. The root that held your tooth in place will be gone, causing your jaw to begin to deteriorate. Other teeth will move in an attempt to fill in the empty space left by the missing tooth. Your facial shape could change without your teeth to support the muscles, and your chewing function will diminish. If you are missing one or more teeth, schedule an appointment today to explore your options. 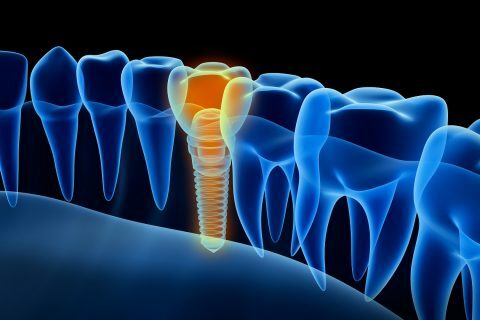 A dental implant begins with a titanium post that is surgically implanted into your jawbone, acting as a root to hold a replacement tooth, or dental implant restoration, in place. This provides obvious benefits in strength, longevity and stability. Dental implants are artificial tooth replacements used to counter tooth loss. Although you have a number of restorative options for the treatment of missing teeth, none have proven to be as functionally effective and durable as implants. In many cases, dental implants may be the only logical choice for the restoration of all necessary functionality of the teeth and supporting structures. Dental implants deliver the comfort, appearance and function of natural teeth. If missing teeth are causing you pain or embarrassment, we can help. The entire process from surgical placement and follow-up to final teeth replacement procedures are done in-house, under one roof. Call us today for your complimentary consultation appointment. Dental implants are designed to replace missing teeth using a special metal post to secure an artificial tooth or crown. The post is implanted into the jaw bone and an attachment called an abutment holds the crown in place. The crown is designed to look like a natural tooth, using durable materials that can be custom tinted. Implants have become a very popular alternative to bridges and dentures, offering patients a tooth replacement option that looks and feels like a natural tooth. 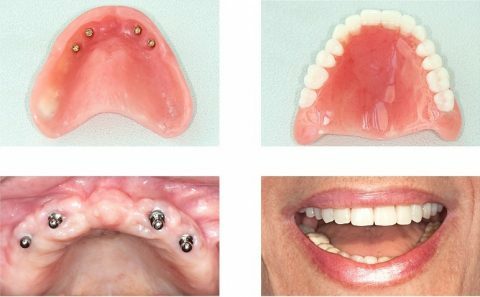 Is an implant better than a bridge or denture? Implants do offer some advantages over both dentures and bridges. First, because they’re designed more like natural teeth, most patients find them a much more comfortable option, and because they’re permanently attached, there’s no risk of embarrassing slippage or sore spots. But beyond that, implants offer a more significant advantage. Because they’re anchored in the bone, they stimulate the replacement of old bone with new bone tissue, preventing bone atrophy that occurs when dentures and bridges are worn. Bone atrophy can contribute to additional tooth loss and interfere with the way dentures fit. Most implants take about three visits. At the first office visit, the metal post is implanted into the jaw bone. The post will be allowed to fuse with the bone tissue for several weeks before the second visit. During that appointment, the abutment will be attached to the post and an impression will be made and sent to the lab where the crown will be created. At the third visit, the crown will be placed on the abutment and gently shaped for a perfect fit. Coverage for implants varies from one insurance plan to the next. When insurance does not cover all the costs of an implant, our office can help patients identify financing programs aimed at helping them fit the cost of their care into their budgets.